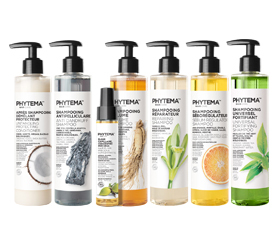 Phytema™ natural and organic anti-dandruff shampoos are made with more than 99% natural ingredients, ensuring that they are as gentle as can be on your scalp and hair. More than 20% of these ingredients of natural origin are produced organically. Quaternary ammonium-free. Dandruff is caused by a fungus called Malessezia, which is present in all of us but that develops to a greater or lesser extent for some people. This fungus feeds on sebum, which is secreted in greater quantities owing to factors such as stress or pollution. This causes increased growth of the fungus, and results in the appearance of dandruff. Indeed, this fungus accelerates cell growth and thus its own renewal. The cycle is reduced from 28 days to 14 days, or in some cases, even less. The cells do not have the time to divide when they arrive at the skin's surface, and are therefore still connected to each other. When these cells die, the cluster is large enough to be seen by the naked eye; this is what we call dandruff. However, there are several ways of eliminating dandruff. Tea tree, bay laurel and juniper are all known for their anti-fungal effects, and thus serve to halt the cycle that causes dandruff. 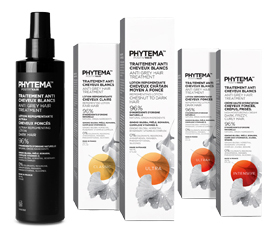 Anti-dandruff shampoos act primarily by regulating the scalp by means of active ingredients that regulate sebum production, as well as anti-fungal ingredients that act on the fungi present on the scalp.